Summary Three bay RAID 5 class NAS powered by quad-core Annapurna Labs processor. Last month, I reviewed the ASUSTOR AS4004T, a very capable 10GbE-enabled 4-bay NAS priced at $360. This review will focus on QNAP's new TS-332X. I'll be comparing it to the AS4004T. The TS-332X has a bit of an odd configuration. Typically, most NAS vendors sell either two-bay or four-bay NASes into the Home/Soho market. While QNAP has plenty of two and four-bay models, they've also rolled out a trio of three-bay NASes. The chart below from QNAP's website shows the top-of-line TS-332X (left), mid-level TS-351 (center) and entry-level TS-328 (right). Our review sample was the TS-332X-4G ($419) with 4 GB of RAM. QNAP also sells a 2GB version - the TS-332X-2G for $379. The only advantage with three bays should be lower cost. But since QNAP doesn't make two models on the 332X's platform that differ only in the number of bays, that's only conjecture. For this review, I'll be looking performance with both 1 Gigabit and 10 Gigabit connections, comparing the QNAP TS-332X-4G with the ASUSTOR AS4004T. I chose the ASUSTOR NAS because it was similarly priced, though cheaper, than the TS-332X-4G. The chart below, generated from our NAS Finder, shows a top-level comparison between the two NASes. Several differences immediately pop out. First, the TS-332X-4G has 4 GB of memory, upgradeable to 16 GB, while the AS4004T has only 2 GB and can't be upgraded. The TS-332X also features three M.2 SATA SSD slots for SSD Caching. The ASUSTOR has no provision for SSD caching. In addition, the TS-332X has three USB 3.0 ports as compared to the two USB 3.0 ports found on the AS4004T. You can look at a complete features comparison here. In the Ethernet department, both NASes support two aggregateable 10/100/1000 Gigabit Ethernet ports and a single 10GbE port. But ASUSTOR has opted to make its 10GbE port 10GBASE-T (aka "copper" 10GbE), which connects via a standard 8 pin RJ45 jack. QNAP instead made its 10GbE port SFP+, which requires a special cable and is better suited to point-to-point and switch uplink connections. The callouts below show the front and rear panel of the TS-332X. There is a front panel USB 3.0 port with a USB copy button. The rear panel has two Gigabit Ethernet ports, one 10 GbE, and two additional USB 3.0 port. Interestingly, there's also an audio 3.5mm line-out jack. There's a hardware setup guide available for the TS-332X. It details how to install disk drives (no tools required for the disk trays), how to install the SSD modules, and how to change memory. The image below shows the location of the SSD modules and SODIMM memory with the chassis removed. The 332X is easy to open (three thumbscrews on the rear panel) and you can get to all the memory slots easily. Of note is that QNAP specs the drives as hot-swappable. While it would be awkward to remove the cover with the drives spun up, it can be done. The photo below shows the main board with the Annapurna Labs processor covered by a large heat sink. The SODIMM module is located in the lower right corner of the PCB. The flex circuits at photo left line up with the M.2 SSD connectors. The table below summarizes the key components for the TS-332X-4G and the AS4004T. Note the 10GbE SFP+ interface is built into the Annapurna Labs device. Power consumption with three SmallNetBuilder-provided WD Red 1TB (WD10EFRX) drives was 24W (active) and 15W (power save). Fan and drive noise was rated as very low. RAID 5 rebuild for a 3 X 1TB volume was ~ 2hour and 45 minutes. 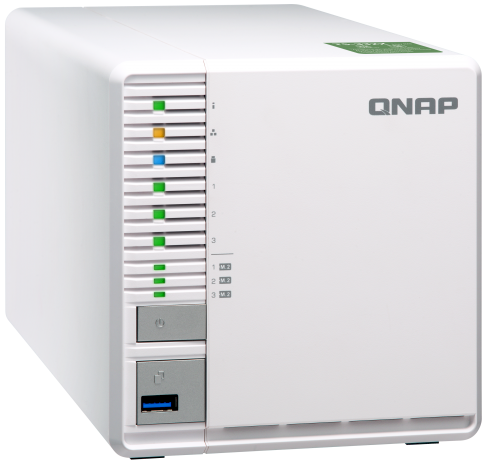 QNAP NASes all use its QTS operating system. The current version, just recently released, is QTS 4.3.5. You can read or download a comprehensive brochure here. Complete hardware specifications for the TS-332X-4G can be found here. Software features can be found here. QNAP has a YouTube channel that hosts the QNAP College. There are videos covering hardware installation, initialization, setting up myQNAPcloud, Network Access protection and a tutorial on how to backup your MAC. QNAP has an online demo that lets you explore many of the features and lets you experience the user interface with all of the menus. You can also browse the APP Store to see what additional programs are available to run on your NAS. One new feature that may startle you is Vocal Warnings. On QNAP NASes equipped with a speaker, such as the TS-332X, QTS 4.3 announces important alerts via voice. This eliminates the need to find your user manual to figure out what's going on. If you are a beep fan, don't fret. You'll still hear those from time to time, too. Note: The online demo used to generate the screenshots below uses QTS 4.3.4. The website advises that the demo will be upgraded to 4.3.5 soon. The image below shows the landing page for QTS 4.3.4. I've included a short gallery containing a few more screenshots below the landing page. Firmware version 4.3.5.0728 was loaded onto the TS-332X-4G and performance tests were run using the Revision 5 NAS test process. All tests were run using Western Digital Red 1 TB (WD10EFRX) (x3 SNB supplied). The primary focus of this review is the 10 GbE performance of the TS-332X-4G and how it compares to the ASUSTOR AS4004T. As we've pointed out in many reviews, NAS performance is often limited not by the ability of the NAS to handle a heavy load, but rather the limit of Gigabit Ethernet and a single client. If you want to break the 1-Gigabit barrier, you need to use multiple clients, enable link aggregation on the NAS ports and connect through a switch that also supports link aggregation. Or you need to move to 10 GbE. Although 10 GbE will cost more for both NAS and client, this method supports higher throughput with a single client with no link aggregation required. To get a feel for how the six 10 GbE products in our charts performed, I created a chart for 10 GbE RAID 5 File Copy Write and 10 GbE RAID 5 File Copy read. For RAID 5 File Copy Write, the TS-332X-4G was fourth at 228.5 MB/s, compared to the fifth-ranked AS4004T at 189.8 MB/s. For RAID 5 File Copy Read, the TS-332X-4G was the slowest NAS of the six products in our chart. The two top performers for RAID 5 File Copy Read had almost three times the throughput of the TS-332X-4G. It's important to note that since the TS-332X-4G only has three drives, it is not capable of RAID 10. However, the NAS Ranker automatically does not include benchmarks with null values in the ranker calculation. Because this can skew ranker results in favor of less-capable products, 0 values were instead entered for all benchmarks that could not or did not run. This also included the Network Backup benchmark which could not be run because the Hybrid Backup Sync app would not mount our rsync target machine. The TS-332X-4G chart was edited so that you can perform direct line-by-line comparisons for each test. The first four tests results are interesting. The TS-332X-4G outperformed the AS4004T on three of the four tests. The AS4004T, however, significantly outperformed the QNAP for RAID 5 File Copy Write Performance. For the NASPT File Copy to NAS test, the TS-332X had a clear advantage over the AS4004T for both RAID 0 and RAID 5. However, for the File Copy From NAS test, the tables were turned, and the ASUSTOR outperformed the QNAP NAS. In total, of the 22 tests that both performed (excluding RAID 10 tests), each NAS outperformed the other NAS on 11 of the tests. Some time ago, we created a separate class for RAID5 10GbE-capable NASes. The chart below shows the six current 10GbE capable NASes. Since there are only six NASes, I decided to leave the results sorted by Rank. The NAS Ranker shows that the Synology DS1517+ still has our #1 ranking with the QNAP TS-332X-4G being the #6-ranked NAS. For the 10 GbE category rankings, the ASUSTOR AS4004T outperformed the QNAP TS-332X-4G in every category. As noted above, 0 values were entered for all the QNAP's RAID10 benchmarks, which could not be run. Our NAS Ranker allows a product to belong to only a single class, so it's difficult to see how an individual 10GbE NAS might compare to all other RAID 5-cpaable NASes with 1GbE connections. Since both the TS-332X-4G and AS4004T are priced well below the next most expensive 10GbE-capable NAS, both NASe were temporarily classified as RAID 5 class NASes to see how they would compare. The chart below shows the top six RAID 5 NASes, sorted by rank. As you can see, the AS4004T would be the #2-ranked RAID 5 NAS and none of the other less expensive NASes have a higher rank. That makes it the best value for a 4-bay NAS. The QNAP TS-332X-4G would be ranked #5 as a RAID 5-class NAS. The chart below shows the category performance ranking of the TS-332X-4G, as a RAID 5 NAS, compared to the AS4004T. The ASUSTOR AS4004T won every category except for iSCSI where the units had similar performance that resulted in a tie. The QNAP TS-332X-4G and the ASUSTOR AS4004T are both priced to bring them within better reach of buyers with thinner wallets seeking higher performance for large file transfers. Currently priced at $360, the AS4004T boasts four bays vs. the TS-332X-4G's three. With four drives, the ASUSTOR is capable of higher storage capacity and supports volume types the QNAP can't (RAID5 + spare, RAID6, RAID10). However, AS4004T has only 2 GB of non-upgradeable RAM, limiting its use for virtualization applications. Still, AS4004T performs well enough that it would be the #2 ranked RAID 5 (1GbE) class NAS, and, as a 10GbE NAS, handily outperformed the TS-332X-4G. And don't forget the AS4004T's 10GbE port is 10GBASE-T (copper), not SFP+. The QNAP TS-332X-4G, while trailing the performance of the AS4004T, does have some features that definitely still make it worth consideration. First, the 2GB model TS-332X-2G ($379) currently costs only $19 more than the AS4004T. And both models of the TS-322X are upgradeable to 16 GB, which would make them a viable hardware platform for virtualization. (You will have to discard the current SODIMM if you upgrade, however, because there is only one RAM slot.) In addition, the TS-332X boasts three M.2 SATA SSD slots for SSD Caching, which could significantly boost performance. If you're looking for a top performing 4-bay NAS, the ASUSTOR AS4004T still offers the best value of the 10GbE NASes we've tested.